Where is it? : ‘Bowman Park’ is about 5km E of Crystal Brook off the Gladstone-Huddleston Road. History: ‘Crystal Brook Run’ was established in 1847 by William Younghusband and Peter Ferguson. The Run covered 560 square miles. 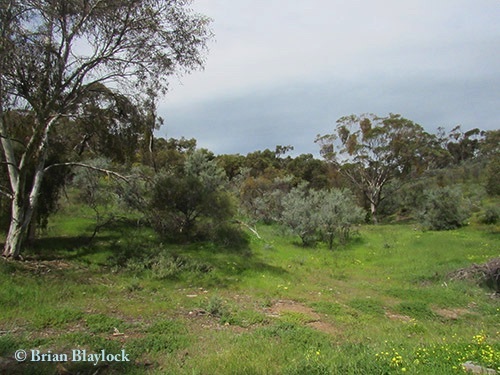 The Bowman brothers took over the ‘Crystal Brook Run’ lease in 1852 and operated it for the next 24 years, until the land was resumed for agricultural use under the Strangways act in 1876. Habitat: Along Crystal Brook there is Woodland of South Australian Blue Gum (Eucalyptus leucoxylon). On the higher slopes there is Mallee Box (E. porosa), Southern Cypress Pine (Callitris gracilis). 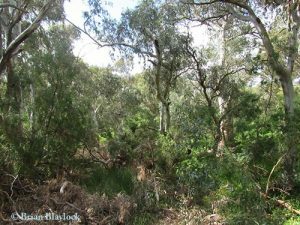 Undertstorey plants here include Elegant Wattle (Acacia victoriae), Golden Wattle (A. pycnantha) and Sweet Bursaria (Bursaria spinosa).